Thor's OS Xodus: Securely Migrating from Microsoft Windows to Mac OS X provides readers with everything they need to securely and successfully migrate from Microsoft to Mac. It includes information that can be found nowhere else, enabling users to execute a MSFT to OS X migration seamlessly and with minimal downtime. The text is the most complete roadmap for entities that want to move away from Microsoft and decouple their dependency on Microsoft products. It is a perfect choice for enterprise computing, providing the ease and simplicity of a UI that can also be incredibly customized via configuration files because of its BSD core. The text, authored by Thor Mullen, the founder of the "Hammer of God" security co-op group and Principal Security Architect for a worldwide, multi-billion dollar commerce platform, provides the perfect combination of Windows and Unix. Information Security professionals of all levels, systems architects, app developers, project managers, IT decision makers, and a general consumer audience for those who want to migrate their systems. Timothy “Thor” Mullen is an independent programming consultant who, after 25 years of supporting Microsoft operating systems and programming languages, has completely abandoned all Microsoft technologies in favor of Apple OS X and open source systems such as Linux and BSD. 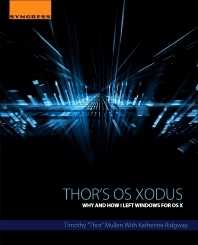 After years working for the software giant, Thor now condemns the company for their unethical practices and evangelizes for Apple OS X and open systems and has committed his research to the betterment of users by providing guidance for users to switch from their dependency upon Windows and enjoy the superior, secure, and feature-rich experience that is OS X.